This was first posted in March 2010 following the Apple World Leadership Summit in Prague and updated in February 2011. Several great presentations I've been to today have been about transforming learning through technology. One very interesting one was called Strive for Transformation by Stephanie Hamilton of Apple. Stephanie talked about the Apple Classroom of Tomorrow (ACOT) study from 1985-97, which looked at moving from instruction to construction of knowledge and measured teacher's comfort with technology. Now, however, the focus shouldn't be on the technology but on what you do with the technology - and what it can do for you. Substitution involves doing the same thing as you would do without the technology without any modification of the assignment, for example typing out the work using a word processor rather than handwriting. Augmentation - involves some functional improvement but is still a direct tool substitute - again the assignment is not changed, but perhaps some of the built in tools such as the thesaurus, word count, spell check etc might be used. Redefinition - doing something that was inconceivable without technology, giving students a stage for example posting on the web so that the audience is the world and there is a feedback loop. Examples could include collaborative writing - writing is for the real world - eg wikis. Stephanie's point was that if you are using technology but are not striving for transformation it's a waste of time and money. Later I attended another presentation on a similar theme: Transforming learning one conversation at a time by Jenny Little, the Director of Curriculum and Professional Learning at Munich International School. Jenny talked about the learning conversations they have been having at MIS, such as how to design curriculum, finding appropriate challenges for all students given the diversity of their student body, using Project Zero's Visible Thinking routines, language acquisition and the relationship between learning and story-telling. learning environment, curriculum, instruction and assessment - each layer is important and adds to the entire cake and you cannot leave one layer out of the whole. Jenny discussed how the SAMR model gives their teachers a common language and draws out the specifics of what they do and why. 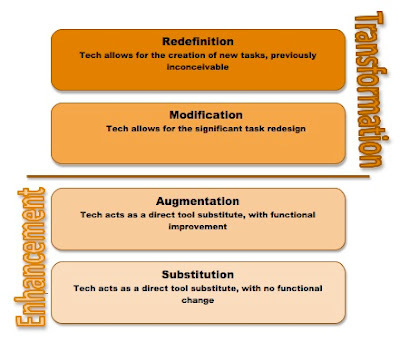 Many teachers are still using technology as substitution and augmentation - we have to try to move to the stages that represent transformation. In transformation students need to be participating in their learnings as we know that learning is socially constructed. Visualisation is important to make the abstract concrete. Students will become engaged and motivated through bringing the world into the classroom. Learning is a partnership - the teacher doesn't have all the knowledge - students are also empowered to find resources. As teachers started looking at how the technology could transform learning they knew they needed to come up with assignments that showed engagement, deeper analysis, more real life application, that students need to communicate, and that learning is interdisciplinary. If you want teachers to move to redefinition and modification you have to give them the right tools so they can do that. One of Jenny's final thought were that a good tool that allows redefinition could be VoiceThread - she explained why it could be more powerful than, for example, iMovie as it allows collaboration and that students around the world can work together to make a single VoiceThread in a way that would be difficult to make a single iMovie. One interesting idea that Jenny had is having reading groups for her teachers where they come together to discuss books. She recommended, among others, Daniel Pink's Whole New Mind and his latest book Drive, as well as Howard Gardner's Five Minds for the Future. This is such a great idea I am going to suggest this once I am back at school again. Perhaps it would be possible to set up a small reading group that met one lunchtime every month to discuss some of these books and to help us talk about how these can impact on our teaching. I'm not familiar with the SAMR model but have been trying to help my teachers understand the difference between enhancement technology and transformative technology. 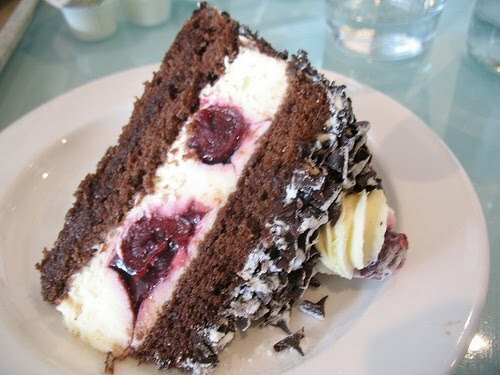 I like the example of the black forest gateau, easy to understand and simple...thinking about my next PD training for teachers and how I can use from this example. Thanks for sharing your learning with us! Hi Maggie, My name is Gareth and I have just taken up the role of PYP Co / Tech facilitator at AIS/Dhaka. I came across your prezi on the role of ICT in the PYP, which was really helpful in helping me plan a PD session. The SAMR model fits so well with PYP and I think will help our teachers make some authentic connections - Thank you! This is a great article and inspirational. After hearing once about the SAMR model in a video, I am informed now. Love your explanation and feel I have hit a goldmine. You have given me something to share in our District: An answer to the "What & Why" on technology integration. Thanks so much! Thanks for your comments Peggy. I have found the SAMR model to be very useful when talking with our teachers about how technology can transform learning - not just be seen as a tool or a skill. Nice to trace through your posted notes..I have a Heads of Department meeting tomorrow with your work as our focus. I was trying to find resonances within my Creative and Performing Arts Department..can you give me a pathway? What can you do on a computer that is completely transformative in your department? Let me give you some examples that I've supported teachers with before - students have used WeVideo collaboratively to create book trailers, they have used Galaxy Tabs to photograph their artwork and add to this their ePortfolios and reflect on their progress. In the PE department students have used video and added it to VoiceThread and reflected on it. They have apps on the iPads that allow them to record and analyze their performance. In music students recorded their own original compositions and add these into other projects (for example adding to photos and turning into a slideshow using Animoto). When I lived in Thailand students created Flash animations to try to visually represent different themes in music such as rhythm, harmony, timbre and so on. These were used as backdrops to musical performances. Not sure if any of these ideas help or not but good luck with your department meeting. Hi Maggie, I am revisiting one of your older blog posts because I now find that I need the information. I appreciate the support that you are unknowingly giving me. I remember reading about the SAMR model here on your blog and researching a bit but it was not something that I needed at that time in my classroom in Beijing. Now I am in Guatemala working as a Technology Integration Specialist for Grades 2-5 and I realized I need a scaffolding upon which to hang my thoughts and hopefully the direction of my teachers. One of the members of the Google+ Community iPad Ed, of which I am a member, mentioned the SAMR model and I remembered that I had read it on your blog so I just did a Google search and there it is. I provided it as a link in my reply back to the Google+ Community. Thanks for your comment Heather. I'm glad to hear things are going well in your new job and that this post has been useful for you and your teachers. This post remains my most popular post ever with over 15,000 pageviews. 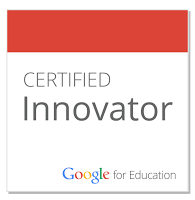 Thanks for sharing it with your Google+ Community.